I am hoping that perhaps one of you other knowledgeable crew members might know what this is and if I did right by removing this. I left it alone thinking egg sack but then several minnows got ensnared and started to decompose. I removed that and today I noticed this on basically in the same spot. I do have spaghetti and feather duster worms, which I enjoy watching. Is this a sign of stress or hopefully happiness of the worms? I have looked online and have been unable to find a match to the attached photos. Any knowledge you have would be appreciated! Good afternoon! I am writing in regards to this particular article about the white worms (notably, the one adjacent to the Nassarius snail). I work at a lfs and the other day a customer showed me a video of several of these white worms swimming around his tank. When they hit the glass they would stick. I spent a few hours reading over this particular link and others hoping to find out what exactly they are. 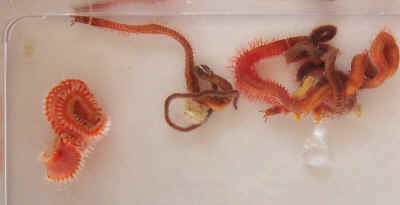 Is it possible that these white worms are in fact the same epitoke bristle worms described in the white worm response? I just wanted to check with you guys before I gave the customer an answer. Also, he says he sees them at night-- like, 2 or 3am.